What geographic area constitutes Down East Maine is a hotly debated topic. Some like to think that it's the entire state. Others prefer to think of Southern Maine as Northern Massachusetts. 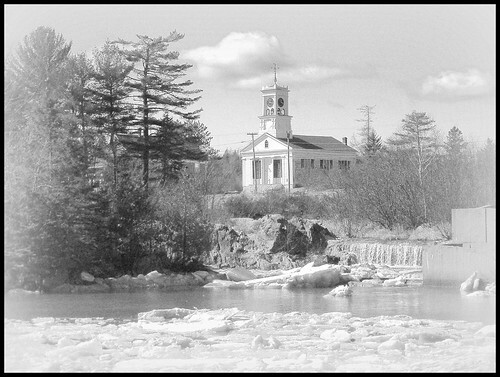 My personal notion is that it begins at the bridge across the Penobscot River on Route One just south of Bucksport. What is certain, as one travels another 20 miles up Route One, after passing through the big box nightmare of High Street in Ellsworth, heading toward Washington county--the last before Canada, the landscape, the towns, and even the very light, take on a different cast. The landscape gets wilder, more harshly beautiful, the economy is poorer, and distances seem greater. 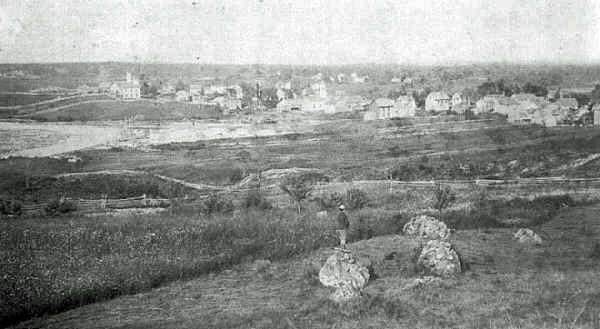 The tiny town of Columbia Falls, a former lumbering center, just off route 1, is no further from Ellsworth than the shopping hub of Bangor to the west, but it seems light years further away. Be still my heart. The chaste miniature mansion pictured above is the Ruggles House, situated on a crook on the Main Street of Columbia Falls, as it appeared when the Historic American Buildings Survey first photographed it in the 1930's. But, back to the Ruggles House. 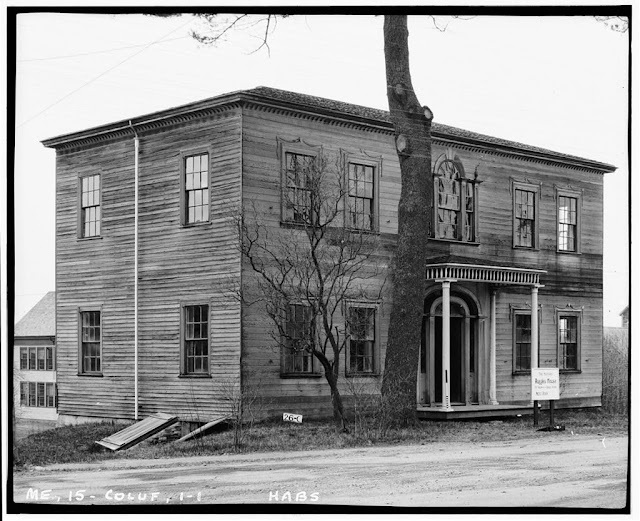 It was built for Judge Thomas Ruggles, a lumber baron, back when this part of the world was still the Eastern frontier, and trees were tall and plentiful. Basically only four rooms and a hall, with an ell kitchen in back, but oh what rooms, what a hall. Ruggles and his builder pulled out all the stops with this house. The house is only one room deep, two rooms on either side of a hall on each floor. The workmanship is fine, yet charmingly naive. The columns on the little porch are Corinthian, but like nothing one has ever seen. The builder has interpreted the drawings in a new way, and the little capitals, support an openwork frieze that would seem incapable of actually holding up even the small roof. On the main cornice, a Benjamin drawing of a cornice with applied leaves has been improbably and excitingly interpreted as openwork, the leaves freestanding. Over the windows are swags, not carved, but merely in silhouette, each suspended from a little heart. 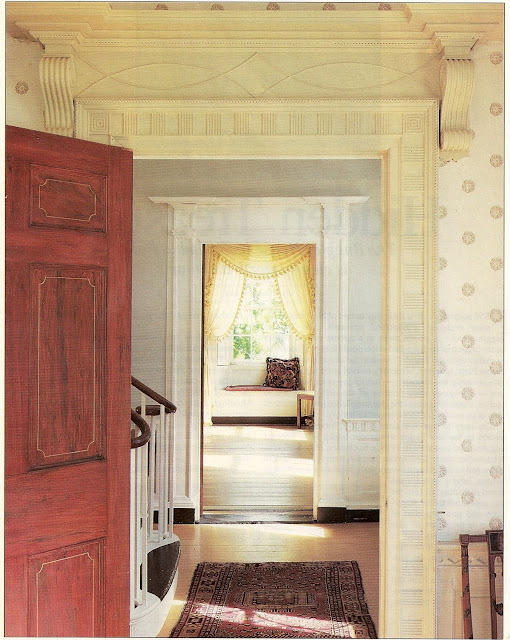 One tears oneself away from this nonacademic, yet classically beautiful sight, enters the graceful doorway, whose design shouldn't work, with its full arch inside a flattened arch, but it does, with delicate tracery defining the fan. And immediately, one loses one's breath. One is in a small, high hall. Directly ahead is a small, perfectly proportioned flying staircase an open flight from floor to landing, quite possibly the loveliest of its type in existence. The main flight sweeps up to the roomy landing, flooded with light from an arched window. 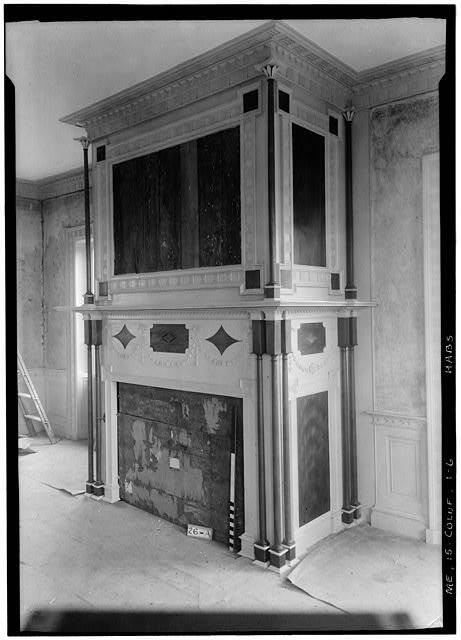 The floors are painted buff, with 'carpeting' painted in black. 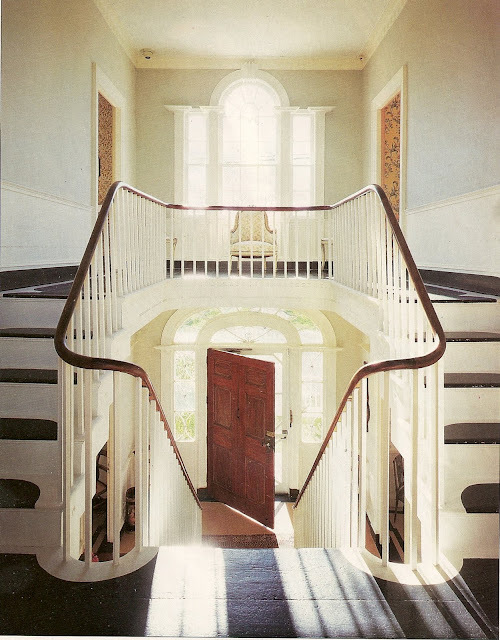 One turns, goes up one of the short flights to the upper landing, and is confronted by a lovely Palladian window, answering the arched window on the lower landing. Many of the details are naively styled and executed, and they maybe shouldn't work, but they do. 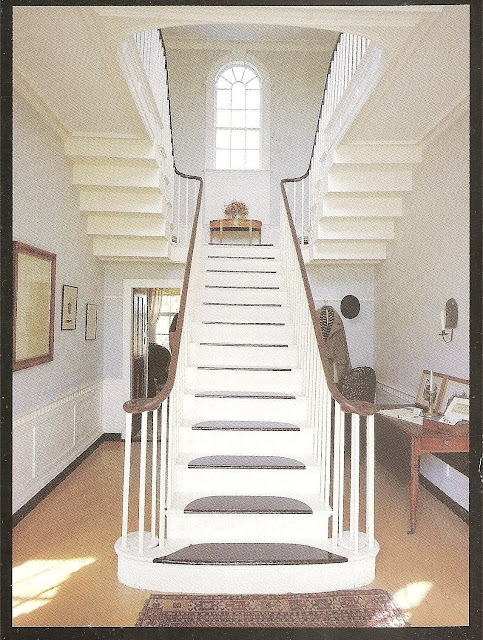 The staircase practically floats, and the pure, crystalline light of the north country makes every molding, every detail stand in perfect relief. The second floor contains two perfectly pleasant bedrooms, but no need to linger....back down the wonderful staircase, and through one of the beautiful faux mahogany doors, in beautiful condition after 200 years, into the dining room. 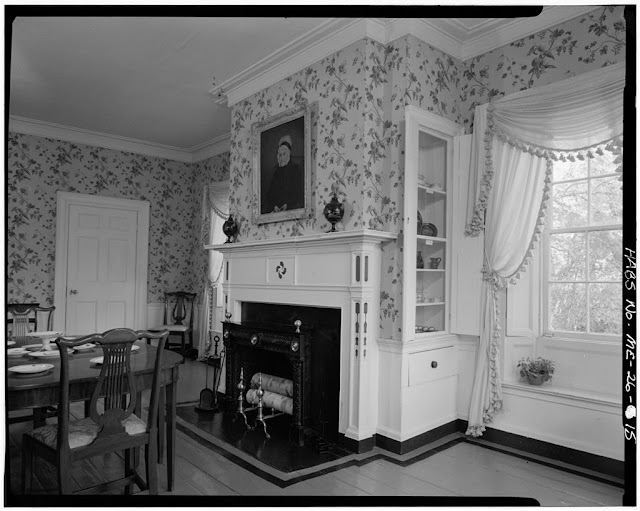 The dining room is a decent sized room, good ceiling height, with deep windows with seats, and an interesting mantel with pinwheel inlays, all nicely proportioned, full of light from the four windows. A set of early Wedgwood creamware is eye catching, decorated delicately with feathers. One crosses the hall to the Drawing Room. And one gasps again. Here the builder has pulled out all the stops. And once again, has performed tricks that shouldn't work by any academic rules, but they do----spectacularly. Perfectly proportioned space, three exposures, deep window embrasures, elegantly detailed woodwork. 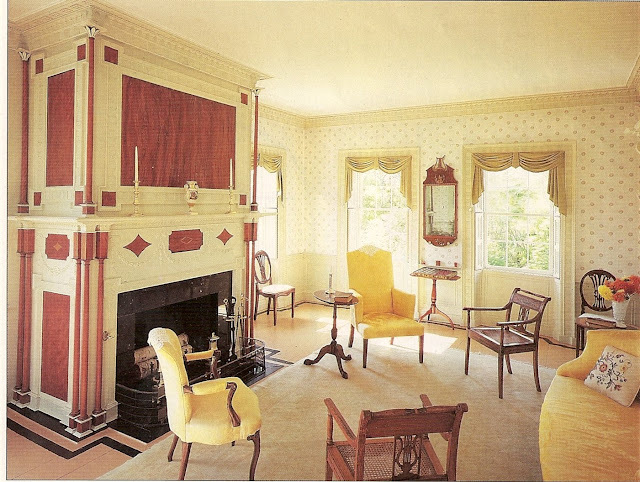 The bracketed consoles over the doors are from an English builder's book, by James Pain. And then, there's the mantel: The chimney breast elegantly projects into the room,, a graceful effect shared with many houses of its period, but this one is almost a structure in itself. A riot of ornament, inlaid mahogany panels, and again, those hollow capitals, that cannot possibly hold anything up. In the early days, the legend of the Ruggles House, this unexpected bit of fluff in the hardscrabble of Washington County Maine, was that an English carver did all the work on the mantel, using only a penknife, his hand guided by an angel. 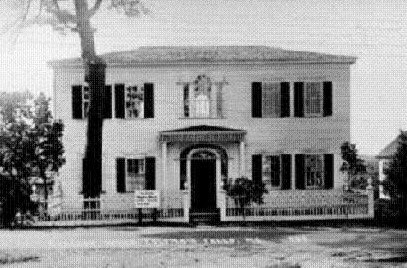 The Ruggles house followed the trajectory of so many historic houses---the family ran out of money, the last heirs lived in genteel squalor, the house barely survived as a weathered ghost. 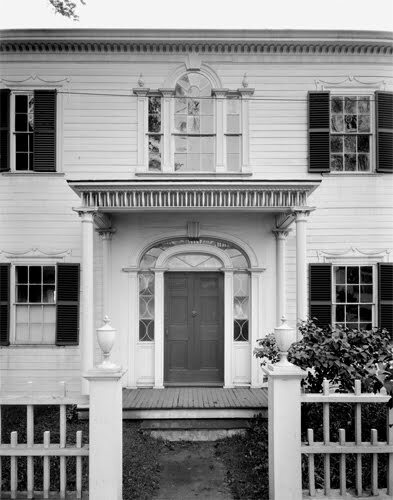 In the early 1900's, William Sumner Appleton, found of the Society for the Preservation of New England Antiquities, visited the house, and declared that it must be saved at all costs. It barely squeaked through the depression, and then was rescued by a descendant, Mary Ruggles Chandler, the first woman pharmacist in Maine. She bought the house, patched it, was able to interest wealthy summer residents from Mt. Desert Island i in her cause, and little by little, the house was brought back to life, open to the public during the warm months. Oh, that staircase! This is on my summer 2010 itinerary! As it should be, young lady! I consider that hall to be an essential part of any aesthetically inclined Down Easter's essential list. The photographs can't fully convey the airiness of the space, and the perfect scale in a relatively tiny area. And then you can drive from there to Cape Split and have a picnic where Marin painted.